Much more than the former UCI World Champion, Sagan is a showstopper known for protagonizing hilarious moments everytime he talks. 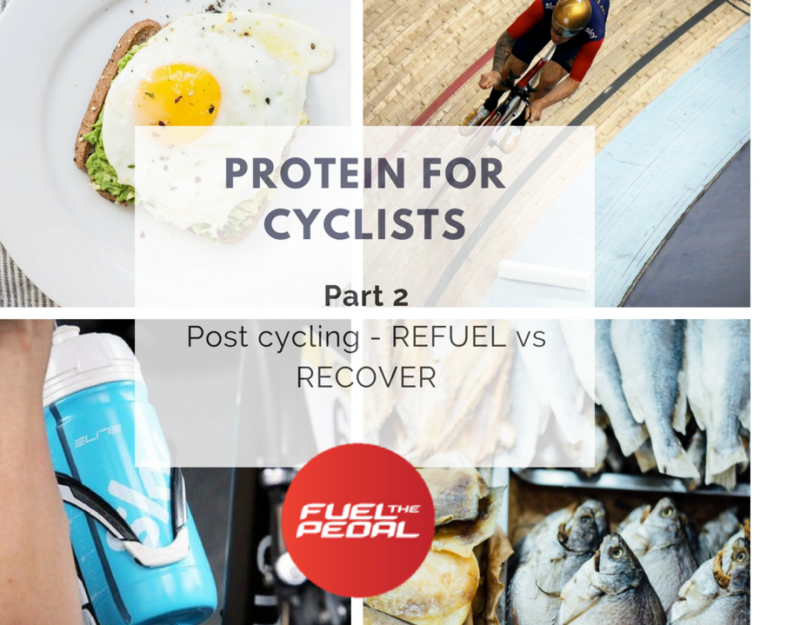 One of the most particular scenes is worth a nutrition review by Fuel The Pedal. 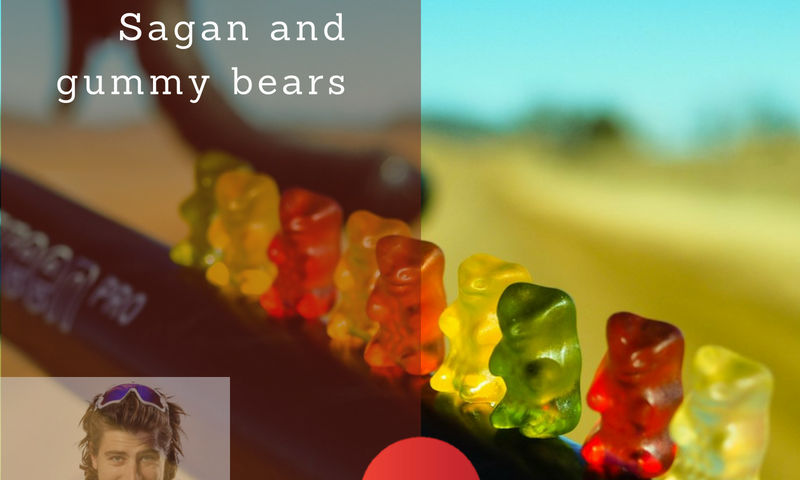 Back in 2017, after winning the annual single-day road cycling race Kuurne-Brussels-Kuurne in Belgium, Sagan was filmed grabbing a handfull of Haribo gummy bears and quickly feast on them as a child would. According to nowadays’ sugar fobia syndrome, this constitutes an act of heresy against Sagan’s own health and makes absolutely no sense at all from a health standpoint. But in the case of cyclists, particularly Peter Sagan, this act of heresy is entirely justified. The timing of gummy bear ingestion was perfect and as a Sports Nutritionist I couldn’t agree more. He ingested something that he likes, that is practical and very concentrated in carbohydrates (CHO). And no, I don’t think a recovery drink would have been necesarly better. What it matters is that a glucose + fructose palatable food source is ingested as soon as posible. I insist in palatable food sources because often cyclists hungry enough to comply with the fast recovery recommendations. As many of you might know, carbohydrates are the main Fuel for such demanding sports such as cycling (please, let’s not enter in the “dark realm” of Keto and high fat diets to fuel cycling. We’ll cover that topic on future posts) at least if we want to obtain the maximum performance from an athlete, not just fuel to finnish a particular stage or a light training. According to the recent literature, we know that cyclists benefit from periodizing their nutrition, particularly periodizing carbohydrate intake in different days, eating a high carbohydrate diet in days of heavy training or competition and a lower carbohydrate diet in days of light to moderate training. This smart periozation appears to be able to generate positive training adaptations. There’s something that we must make totally clear. Recovering is different from refueling. In other words, in profesional highly-trained cyclists, carbohydrates have a lot more importance than protein. 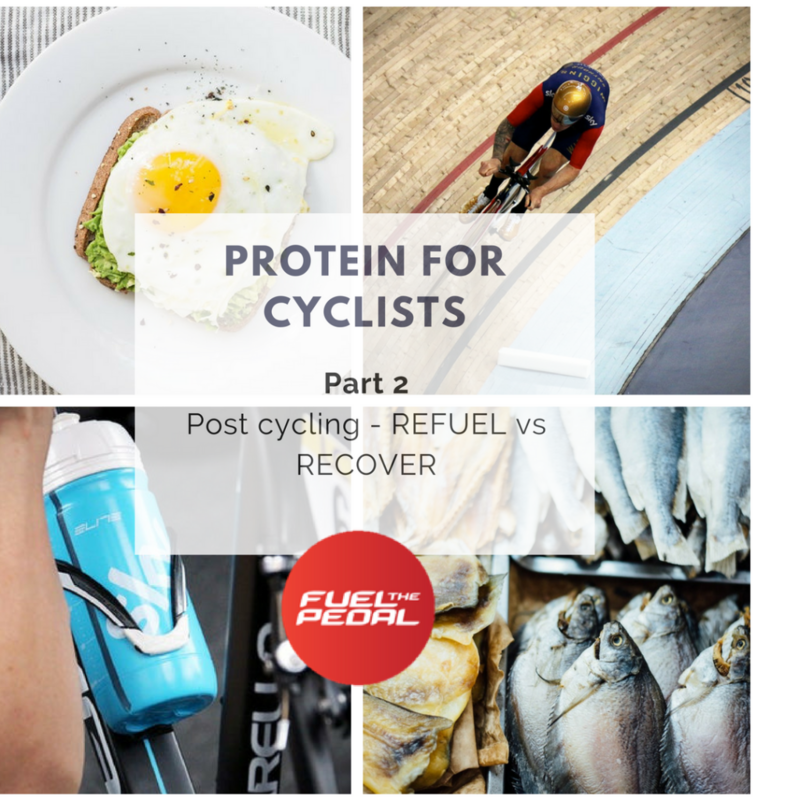 The role of protein as a muscle builder loses strength here, because cyclists like Sagan so well trained, do not break their muscles in cycling, they deplete fuel sources. We must understand once and for all what recovery is. Total recovery is being able to perform the same task at the same intensity (or in the same time) as a previous similar task. This will be determined by the speed and frequency at which we refill our fuel tank, surely not by something as marginal as the reconstruction of a muscle protein fiber that, at those competitive levels, only deteriorates seriously under extreme circumstances. Training low might be benefitial in a training scenario but surely isn’t in a race-like scenario. Definetly not for profesional cyclists from the World Tour who need to be recover as quickly as posible to compete in the next day or the following week, with trainings in between. In this context, the first 4h are absolutely crucial to initiate muscle and liver glycogen resynthesis. Especially if the next competition is in the next 12 to 15h. Feastings on CHO that start as soon as posible and reach >1g/kg/h in the first 4 to 6h in repeated small feedings at 15-30-min intervals, can increase glycogen resynthesis in 30-50%. 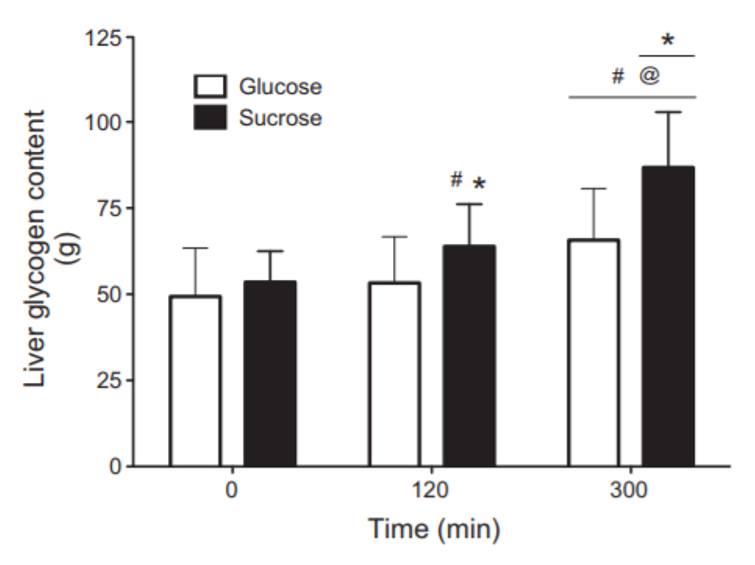 Due to enhanced glycogen synthase activity, higher insulin sensivity and elevated muscle permeability to glucose observed in the first 2h (out of the total 4h) post exercise, this is the most critial moment to concentrate CHO ingestion, no matter the source (quantity over quality for glycogen resynthesis). Glycogen concentration in muscle vastus lateralis is typically 80–150 mmol kg ww−1 in rested muscles. A single 30 second all-out cycling sprint can decrease glycogen content by 22% corresponding to ∼20 mmol kg ww−1, which can deplete glycogen concentration to 7–20 mmol kg ww−1 in m. vastus lateralis after cycling to exhaustion. In the absense of carbohydrate ingestion, the body can still resynthetize glycogen at a rate of 1-2 mmol/kg/h, which is a very low rate. Starting the ingestion 2h after a glycogen depleted state only allows for a resynthesis rate of 4.4 mmol/kg/h, while an immediate ingestion of CHO allows for a resynthesis rate of 7,7 mmol/kg/h. Ideally, ingesting 1.2 g/kg BM/h of CHO during recovery from exhaustive exercise appears to be improve muscle glycogen content when compared to ingesting 0.3 g/kg BM/h. This corresponds to aproximatly 85g of CHO in the first 2h post exercise in a 70kg cyclist (Fig.1). 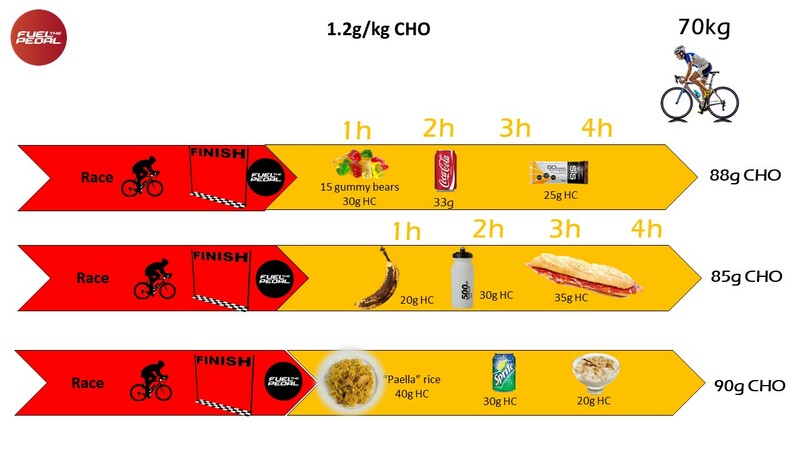 In this context, CHO feedings right after a cycling stage, specially after a sprint win, seem to justify feasting on gummy bears or any other source of carbohydrates. This is not the moment for training low strategies to generate traning adaptations or to be worried about protein intake. There are no training adaptations in competition! Refueling at all costs, as fast as possible, is key. PS: And BTW, in most cases there’s no need to supplement with Protein right after a cycling workout, despite all that “mambo jambo thing” of recovery supplement powders with CHO and protein mixes. Only when ingestion of CHO is suboptimal and you simply dont have enough CHO at your disposal (≤0.8 g kg body mass/h), protein can come to the rescue to increase glycogen resynthesis. But this doesn’t seem superior to ingesting 1.2 g/kg/h of CHO. Aim for 1.2g/kg/h in the first 4h and try to mix different sources of CHO rich in Fructose (FRU), Glucose (GLU) and/or sucrose (SUC) in order to maximize both muscle and liver glycogen resynthesis. So, common meals of rice, pasta, bread might provide essentially GLU, while adding gummies, bananas, plums and even cakes can add SUC and FRU to the mix, enhancing liver glycogen replenishment as well. Surprised? I’d be surprised if you wouldn’t! Three years ago I might have given a different answer to this one. Glycemix index (GI) and the typical insulin theory for obesity have been falling down in popularity as science rises stronger and consistently showing that even in fat oxidation, GI foods may not be an important factor, especially since we know that GI has way more inter-variability than we initially thought. What might need some consideration is the content in high-amylose starch mixture compared to CHO mixtures of glucose, maltodextrins and high-amylopectin starches, the former being less efective in replenishing glycogen probably due to poor digestibility of the former. Leaving GI behind us, let us talk about the different types of monosacarydes and dysacarides and their posible combinations on glycogen resynthesis, mainly Glucose (GLU), Fructose (FRU) and Sucrose (SUC). It appears that SUC (which you can find as regular table sugar which is a perfectly balanced mix of GLU+FRU) and GLU stimulate muscle glycogen resynthesis at a similar magnitude. The same is observed when the same quantity of recommended 1.2 g CHO/kg /h of GLU vs GLU + FRU, or GLU + SUC ingestion show equal muscle glycogen resynthesis rates, with no relation to insulinemia. 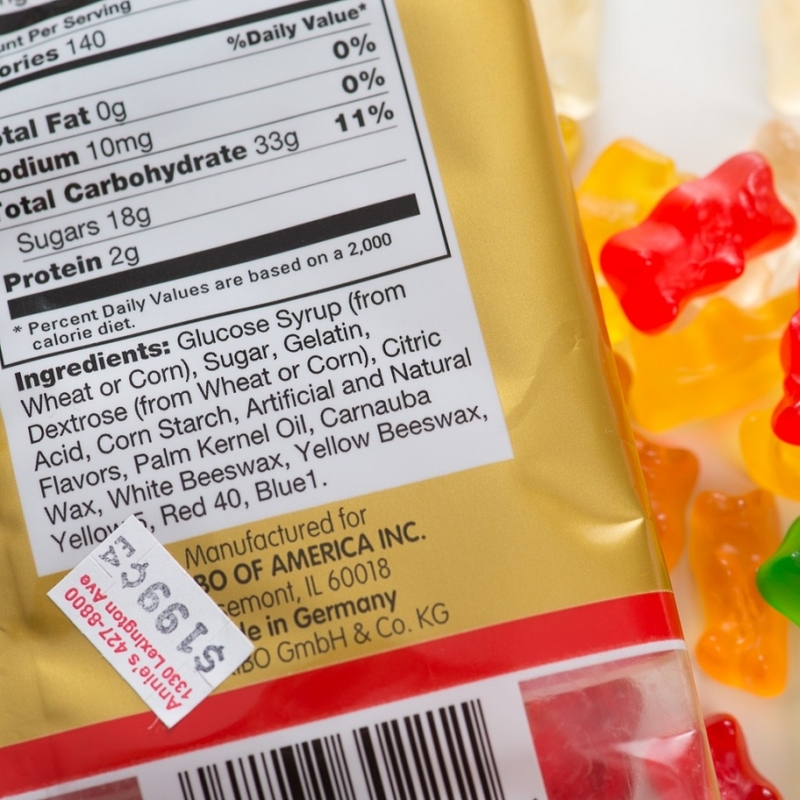 In this context, gummy bears have a mixture of GLU + SUC (fig. 2), which seems adequate glycogen resynthesis purposes, especially if Sagan likes it. So even table sugar (SUC) doesn’t seem to be that bad in a sports context. It appears that it can even accelerate liver glycogen resynthesis much better than GLU alone (Fig. 3). Since both muscle and liver glycogen need to be replenished in order to allow a cyclist to return to competition with the highest posible glycogen levels, the most reasonable strategy might be to ingest a mixture of both GLU + FRU, which has the advantage of reducing gastrointestinal distress when large amounts are ingested. So, gummies, fruits like banana and plums, rice, pasta, and of course bread, are all plausible foods to use in a carb-refill protocol, with no regard to GI or organic food obsession. There’s no short answer here. We might argue that a liquid CHO drink would’ve been much better, but even here science seems to disagree, as solid and liquid forms of CHO-rich foods have been found to be equally effective in providing substrate for muscle glycogen synthesis over 2–24 h. Even during exercise, CHO oxidation appears similar with liquid CHO-rich drink VS a solid food like an energy bar. If Peter likes it that way, period. Go for foods of your personal preference. This is ultimately the most important factor to guarantee that you will actually comply with the recomendations for fast recovery in a moment where cyclists are not in a mood to eat that much. In this context we can say that many of the best CHO are the cheapest and sugary ones. The same phenom happens with energy bars: the best may be the cheaper ones. There’s no need for protein, “healthy fats” or fancy fibre in products to eat during endurance sports. Unless you want to lose your race in the bathroom due to gastrointestinal problems.